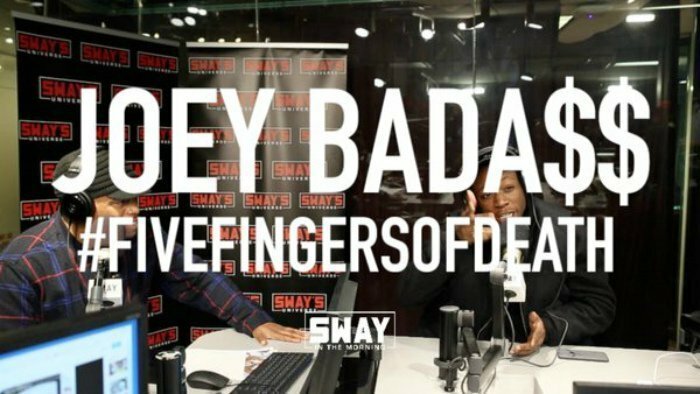 Joey Bada$$ went in hard on his "Five Fingers Of Death" freestyle for Sway Calloway's SiriusXM show, Sway In The Morning. Watch below, as well as the full interview. The young Brooklyn MC is one of the best in the world, and he's only 21 years old. He comes in angry here, responding to fellow NYC rapper Troy Ave's recent diss track, "Badass." It's pretty clear who's winning this rap battle, and Joey's lyricism explains why with the right mix of talent, creativity, humor, and arrogance. Most "Five Fingers of Freestyle" segments feature only 5 beats for freestyles, but this time DJ Wonder throws a total of 7 beats after Joey says he wants to get a million YouTube plays. There's a lot of love on set, for sure.